United Launch Alliance (ULA) successfully conducted a Wet Dress Rehearsal (WDR) on Thursday for its Delta IV- Heavy tasked with the launch of the NROL-37 spacecraft. Meanwhile, the company is continuing to evaluate the underperformance issue with its most recent Atlas V mission, while agreements were signed for its future rocket, the Vulcan – specifically related to the payload fairings. ULA will be tasked with lofting another secret military payload for the US National Reconnaissance Office, with the launch likely to take place sometime in early June. 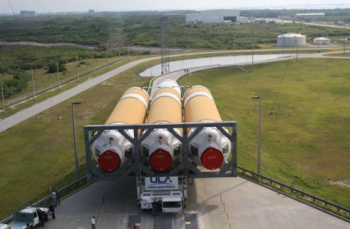 The rocket rolled out to its pad at Space Launch Complex – 37B (SLC-37) earlier this month. It is the same pad from which the Saturn rocket made its first orbital launch in January 1964, with a Saturn I carrying the nose of a Jupiter missile into low Earth orbit. The Delta IV-H is the largest and most powerful rocket currently flying and was utilized to loft the first Orion capsule – during Exploration Flight Test -1 (EFT-1) – on a successful test flight. The Delta IV-H was developed by Boeing as a replacement for the Titan IV which the US Air Force used for its largest payloads throughout the 1990s and early 2000s. At Launch Complex 37B, the Delta IV uses a combination of off-pad horizontal and on-pad vertical assembly. The liquid boosters, first stage and second stage are mated in the Horizontal Integration Facility (HIF) a kilometer away from the pad. On Thursday morning, the MST was rolled back to allow the Delta IV-H undergo the WDR, which allows for a full countdown test that includes the fueling of the rocket. Unlike the static fire tests conducted by rockets such as SpaceX’s Falcon 9, the engines on the Delta IV-H aren’t ignited during the WDR. ULA note the WDR was concluded nominally on Thursday. On launch day, the three Common Booster Cores (CBCs), powered by a single Aerojet Rocketdyne RS-68 engine, will come to life and power the huge rocket uphill. The Delta Cryogenic Second Stage (DCSS) will complete the job, deploying the secret passenger into it desired orbit. ULA’s previous launch involved its Atlas V rocket, launching the Orbital ATK Cygnus on the OA-6 mission to the International Space Station (ISS). The veteran Atlas V rocket launched on its first attempt at the opening of the available window on Tuesday, departing from SLC-41 at Cape Canaveral. The Atlas V’s first stage shut down several seconds earlier than planned, as immediately noticed during the webcast coverage. “During the launch, the system experienced a premature first stage shutdown. 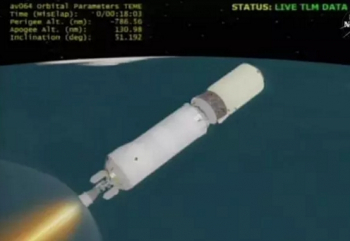 The first stage cut-off occurred approximately 6 seconds early,” noted ULA in a statement. As pre-planned, a further six seconds after engine shutdown, the spent stage separated, with the Centaur’s RL10C-1 engine entering its prestart phase. Ten seconds after stage separation, the Centaur engine ignited to begin a single burn that was pre-planned for a duration of thirteen minutes and 38 seconds. Notably, Centaur’s longer burn allowed it to deliver Cygnus into the correct 230km orbit and into its correct RAAN (Right Ascension of the Ascending Node), which ultimately classed the mission as a success. “The Centaur automatically compensated by burning longer. 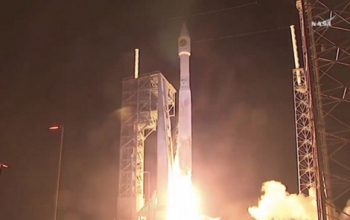 The robustness of the system achieved mission success, delivering Cygnus to a precise orbit as planned,” added ULA. However, the specific reasons for the issue with the Atlas V first stage performance remain under evaluation. “The ULA engineering team is continuing to review the data and has developed initial fault trees with our industry partners. The team has been successful in isolating the anomaly to the first stage fuel system and its associated components,” added the company, pointing to an issue relating to the fuel ratio parameters on the booster. Due to the ongoing investigation, the company has already twice delayed the rocket’s next mission, first to a NET (No Earlier Than) target of May 12, then to an undefined date. “The Atlas V MUOS-5 launch is delayed and indefinite on the Eastern Range due to ongoing evaluation of the first stage anomaly experienced during the OA-6 mission,” which was the most recent notification from ULA, per the Atlas V review. 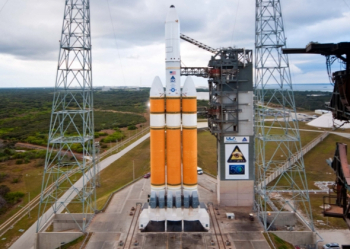 Both the Delta IV and Altas V are expected to be replaced by a new ULA workhorse in time for the next decade. The Vulcan/Centaur vehicle is expected to debut on a test flight in 2019. While there’s been a focus on the aft end, with its installation of American-made engines, the top end of the rocket recently saw the announcement that Swiss company RUAG has solidified its partnership with ULA. Following on from last year’s announcement, RUAG will be setting up base at ULA’s Decatur facility in Alabama. This week saw news that RUAG will supply carbon structures for the Vulcan Centaur launch vehicle. 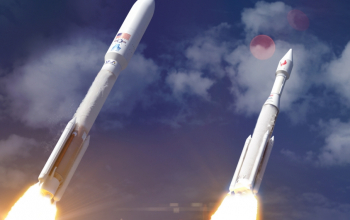 RUAG Space has been supplying carbon-fiber-reinforced components for ULA’s Atlas V launcher for over a decade, and this new agreement expands on their supplier relationship. 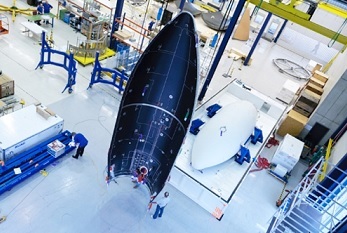 Starting in 2019, RUAG will supply a second type of payload fairing that will be smaller than the one it currently delivers. The date coincides with the debut of the Vulcan rocket. RUAG Space is planning to produce all the components in Decatur while a suitable production location is already being set up and production of the first flight hardware in Decatur is scheduled to start in 2018. It’s been a big week for ULA, with the Bigelow ties also announced for the latter’s aspirations on launching two BA-330 inflatable modules.